Fall is in season and we all know what that means, Halloween is here! At your Halloween party this year reward your guests for all the hard work on their costumes. The Prettiest Costume Halloween Ribbon is bound to put a big smile on any recipients face! Halloween isn't all about scaring people or having the most terrifying costumes, the prettiest costume deserve an award too! 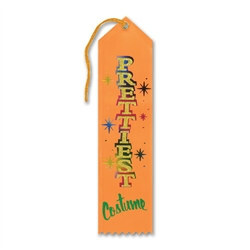 The Prettiest Costume Halloween Ribbon is a bright orange ribbon with a variety of colors that spell out Prettiest. With a separate word, Costume underneath. Match this ribbon with the most original costume Halloween ribbon and with the sexiest costume Halloween ribbon.